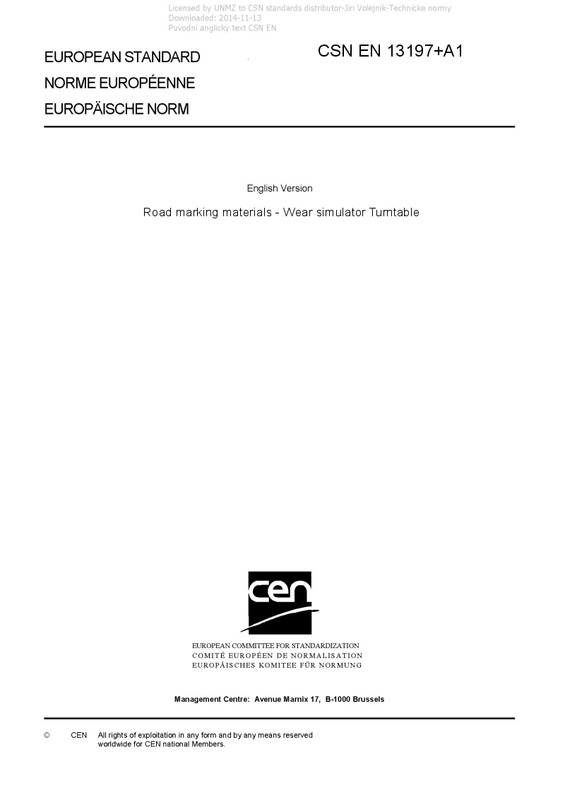 EN 13197+A1 Road marking materials - Wear simulator Turntable - This European Standard specifies the requirements for wear simulator test for road marking materials intended for use in both permanent and temporary road markings including those with increased retroreflection under wet and rain conditions, without road studs. It gives description for the equipment and for test plate’s characteristics; it also gives description for the test method involving road marking materials application, test conditions during wear test, parameters to be measured, frequency of the measurements and expression of the results as a test report. This document gives also the requirements to be followed when the test is to be used for CE marking purposes.